Happy New Year, everyone!! 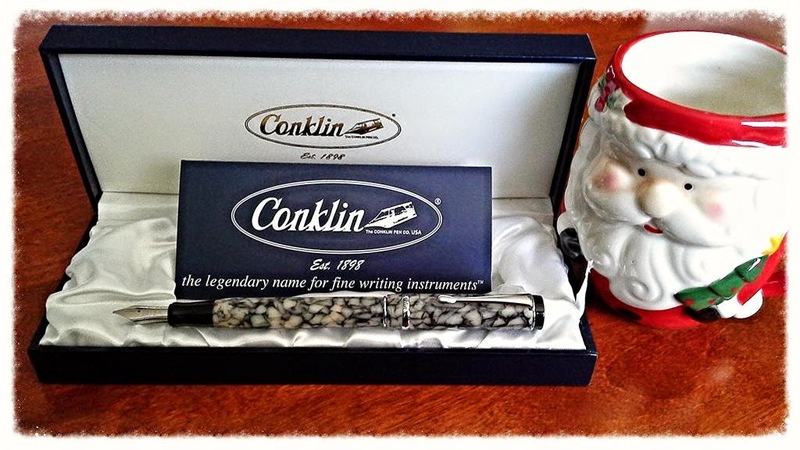 Here's a quick shot of my new Conklin 'Duragraph' fountain pen with factory stub (italic) nib, a Christmas 2014 present from my parents. I love the "cracked ice" design! I really think you will like it, especially in a stub nib! I have a conklin duragraph in Amber with a stub nib and I LOVE it. It is a decently wet writer. I had to prime it a bit (turn the piston to bring more ink down) after just inking it to get it to write with the level of flow i liked. :) Enjoy and congrats! Thanks very much! It's nice to have the choice of a stub/italic nib in a fountain pen, in addition to the usual choices of Fine, Med & Broad (and sometimes Extra-fine).